The John F. Kennedy High School Marching Band and Color Guard has created the Nick Angiulo “Mr. 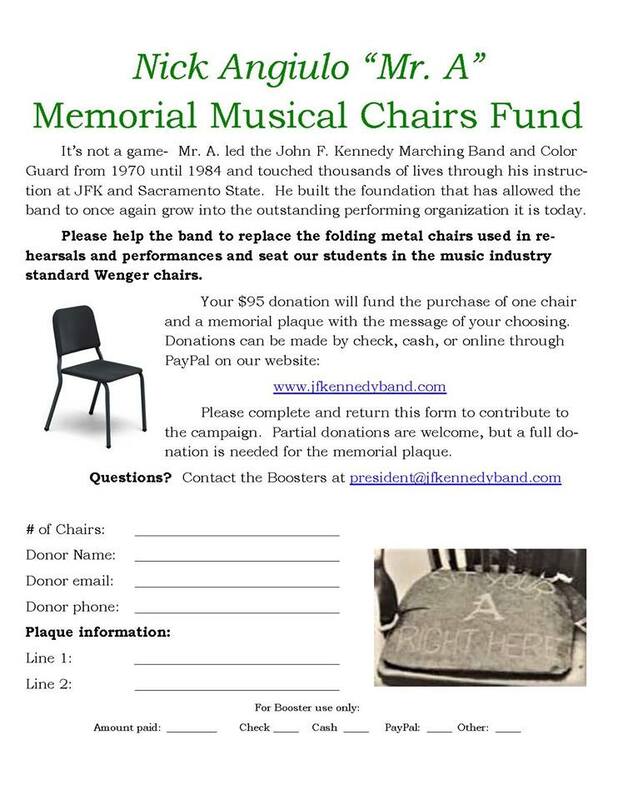 A” Memorial Music Chair Fund to replace the decades-old folding metal chairs used in rehearsals and performances. Our goal is to purchase and seat our students in the music industry’s standard, the Wenger Chair. Your $95 donation will fund the purchase of one chair and a memorial plaque with the message of your choosing. Donations can be made by cash, check, or online through PayPal on our website. Please complete and return this form to contribute to the campaign. Partial donations are welcome, but a full donation is needed for the memorial plaque. Mr. A led the John F. Kennedy High School Marching Band and Color Guard from 1970 to 1984. He touched thousands of lives through his instruction and mentoring. He built the foundation that has allowed the band to once again grow into the outstanding performing arts organization it is today. Thank you in advance for your support. Questions? Please direct them to the Band Boosters at president@jfkennedyband.com. Karen Albert has set up a distribution text list for those interested in signing up to work Kings games, River Cats games, and concerts at The Golden 1 Credit Union Arena. Register your cell phone number here or text @jfkband2 to 81010. Funds earned go toward your student’s Fair Share Fees and/or reducing the cost of your student’s other band or color guard expenses. and spots are still open to volunteer and earn money. Contact Karen Albert ASAP before spots fill up.